Against the Grain Theatre’s biggest project to date is its production of Mozart’s Così fan tutte. As with AtG’s version of Don Giovanni in 2014, retitled #UncleJohn, AtG Artistic Director Joel Ivany has given the opera a new English libretto and title, A Little Too Cozy. The notion of rewriting the libretto for Così fan tutte is not new since critics objected to Lorenzo Da Ponte’s artificial and misogynist libretto as soon as the opera premiered in 1790. In the 19th century the opera, if it was staged at all, was staged with an altered libretto. 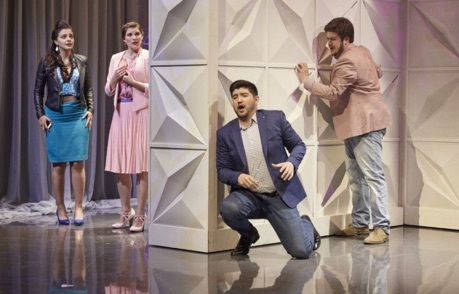 Ivany’s new libretto ingeniously solves many of the opera’s central problem’s but its site-specific staging brings a different set of problems with it. In Da Ponte’s original story, two soldiers, Ferrando and Guglielmo, encounter an “old philosopher”, Don Alfonso. The soldiers’ praise of the virtue of their fiancées Fiordiligi and Dorabella brings out the cynicism and misogyny in Don Alfonso, who believes that all women are like that (“così fan tutte”), meaning fickle. He lays a bet with the soldiers that he needs only a day to prove the fiancées’ fickleness. The two women will be told their beloveds have been called off to war. The men then return disguised as “Albanians” and begin to woo their fiancées, though each man finds he has better luck with the other’s betrothed. The courting moves so swiftly that the two couples, albeit reassorted, are ready to marry by the end of the day, Don Alfonso wins his bet and the four young people are sadder but wiser. The problem with the libretto is that it enshrines the age-old double standard – female infidelity is condemn while male infidelity is not. Ivany’s brilliant solution to this difficulty is to relocate the action to the present and make the men and women contestants on a reality game show called A Little Too Cozy. What we see is the season finale. Felicity (Shantelle Przybylo) and Dora (Rihab Chaieb) have communicated with men from one side of a wall without ever seeing them. After eight weeks they both have found the perfect man and the two men, Elmo (Clarence Frazer) and Fernando (Aaron Sheppard), believe they have found the perfect woman. Before Felicity and Dora can see their fiancés, however, the host, Donald L. Fonzo (Cairan Ryan), tells them their wedding has to be delayed and that in the meantime the women will have to entertain two other men whom they will be allowed to see. With this one conceit Ivany solves many of the difficulties inherent in Da Ponte’s libretto while underscoring the best of Da Ponte’s themes. First, since the two young men have never been seen by the women, they do not have to return in “Albanian” disguise for the majority of the action. 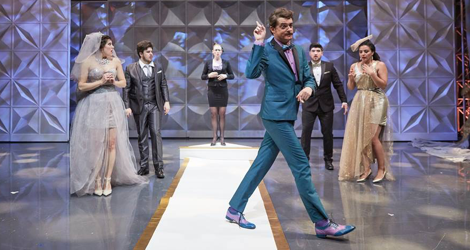 By changing Don Alfonso’s wager into a commercial game show, Ivany transforms the misogyny of one man into the general commercial vulgarity that seeks to humiliate people for the sake of “good television”. Third, the non-physical love that the women and men think they feel without seeing each other is ultimately overwhelmed by the physical desire they feel when that can see each other. Rather than proving that all women are fickle as per Da Ponte’s libretto, Ivany makes the more general satiric point that idealistic love divorced from the physical cannot stand up when confronted with reality. Ivany’s scheme also offers several positive side benefits. Despina (Caitlin Wood), as the talent relations assistant for the show, does not have to take on hokey disguises. She gets an online medical degree to help the men when they fall sick and and another online certificate to marry the couples. Ivany also derives some humour from suggesting that there are past unhappy relationship between Fonzo and Despina. At the end of the show, we don’t feel that Dora and Felicity have married the “wrong” men as in Da Ponte. Rather, they have merely married men who physically appeal to them. Against the Grain Theatre has made a practice of presenting site specific productions – La Bohème in a pub in 2011 and Pelléas et Mélisande in a garden in 2014. Here the notion of using an actual television studio may seem theoretically right, but in fact proves inimical to the enjoyment of the opera. The stage set and the audience bleachers facing it occupy only a small part of the enormous Studio 42 at the CBC building in Toronto. In television studios the sound is miked. For unamplified sounds the acoustics are terrible. There is no bloom around the piano quintet that serves as the accompaniment and no structure as in an opera house to focus and help project the voices. Besides this, there is the constant background whirr of fans cooling the lighting instruments. While it may give an authentic feel to a television studio, the recorded chill-out pop music that kicked in at intermission and immediately after the opera, felt like an aural assault. If I want to listen to “Little Talks” by Of Monsters and Men, I’d like a suitable gap of time before switching musical modes. The show A Little Too Cozy includes background feature on the contestants. These are very funny in themselves but are accompanied by poppy non-Mozartian background music that again offends the ears. In attending A Little Too Cozy, one goes for the entire experience rather than to hear an especially fine performance of the music. The show needs performers, willing to speak the dialogue that replaces the recitatives and able to act convincingly as well as sing. They also have to be willing to learn an eccentric translation of an entire opera they will never need elsewhere. These requirements necessarily reduces the number of singers willing to undertake such an experiment to those who are just starting their careers. The results are an acceptable musical performance of the opera, rather like what one might experience at an opera school, instead of a series of highly polished, exceptional interpretations of the roles. The cast member who produces the most consistently refined sound as well as mastering comic acting is mezzo-soprano Rihab Chaieb as Dora. She had the role of a self-centred, attention-seeking twentysomething down perfectly and produced a lovely, rounded tone that somehow survived the unforgiving acoustics. As Dora’s rival Felicity, soprano Shantelle Przybylo is not as fortunate. Her voice certainly carries but under pressure and in its higher register it becomes squally and unfocussed. Her voice is best heard in Fiordiligi’s lovely aria “Per pietà, ben mio, perdona” most of which is sung quite softly. In terms of acting the star of the show is clearly Cairan Ryan as the slimy game show host. Ryan is not only an expert comic actor but is great at improvisation, as in explaining why his glued-on moustache came and went throughout the show. In singing his light baritone is serviceable but had difficulty carrying in the unkind acoustics. Caitlyn Wood as Despina is in a similar situation. Her characterization of the officious personal assistant who feels she, not the host, is running the show is consistently amusing. Her small, bright soprano, however, gets lost along with Ryan’s baritone in the vastness of the studio. Joel Ivany’s concept is so clever that one would like to see it staged in a real theatre and with more mature singers. He certainly makes more sense of this, the most problematic of the Mozart/Da Ponte operas, than any other production I’ve seen. As well he transforms the misogyny of the the original libretto into a more general satire both of the folly of idealistic love and of a society that enjoys public humiliation as a form of entertainment. This is far more than the Canadian Opera Company’s new production in 2014 by Atom Egoyan was able to do. I hope therefore for a remount of A Little Too Cozy in a theatre. I like the concept. Now I’d like to enjoy the music just as much. Photos: (from top) Shantelle Przybylo, Aaron Sheppard, Caitlin Wood, Cairan Ryan, Clarence Frazer and Rihab Chaieb; Rihab Chaieb, Shantelle Przybylo, Clarence Frazer and Aaron Sheppard. ©2016 Darryl Block.